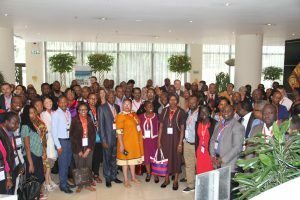 At a recent meeting in Addis Ababa, Ethiopia, the African Society for Laboratory Medicine (ASLM) launched a new initiative called the Laboratory Systems Strengthening Community of Practice (LabCoP). LabCoP is a learning network of multidisciplinary country teams working together to create knowledge and share information, experiences and best practices. It is funded by the Bill & Melinda Gates Foundation (BMGF), and supported by ICAP at Columbia University (https://icap.columbia.edu) and the Extension for Community Health Outcomes (Project ECHO™) at the University of New Mexico, Health Sciences Center (https://echo.unm.edu). LabCoP was launched during a regional workshop on HIV viral load scale up held 23-25 October 2017 in Addis Ababa, Ethiopia. 137 delegates from the Ministries of Health in Africa, PEPFAR, the CDC, WHO, Africa CDC, Global Fund, implementing partners (such as ICAP), and several professional groups including laboratorians, clinicians, researchers, and community activists from 26 countries participated in the launch, contributing insights about their priorities and recommendations for network design.